Nathan's 2nd grade class read the book Flat Stanley this week. Published in 1964, it tells the story of a boy whose father inexpertly tacks up a bulletin board above his bed, only to have it fall and squash little Stanley. He survives, but has become flat! The one great thing about his new body is that he can fold up and mail himself to his friends. 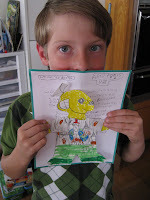 About fifteen years ago a third grade teacher in Canada came up with the idea to have his student practice their letter writing by creating their own Flat Stanley's and then mailing them off to friends, with the idea that they'd get a letter and hopefully a photo back. Nathan's class has been working on letter writing and they started this project as well. I gave Nathan a list of all the people we know who live in cool far away places that he could write to and send his own Flat Stanley... but Nathan tossed the list and said he wanted to write to Grandma with the Big Truck, who lives here in California instead. I guess because the drive is about four or five hours he considers that pretty far away! Grandma was excited to be a part of this, and I had an email from Grandpa saying that they took Flat Stanley on a little adventurous drive today! Can't wait to see what that little guy's been up to!